A chunk of money off an Inno3D model. For the first few months after launch, it was tough to find GTX 1070s for anything close to their recommended retail price. Towards the end of the year, we saw prices dropping to a more reasonable £380 or so for most models, and now we're starting to see them drop even further. The best price you can find one for right now is £350 at AWD-IT. What you get for that money is an Inno3D Nvidia GeForce GTX 1070 HerculeZ Twin X2 graphics card. You don't get any overclocks included with the price, so you're paying for what are essentially the reference card specs with 1506MHz / 1683MHz base / boost clock speed, and the memory speed remains the same too. 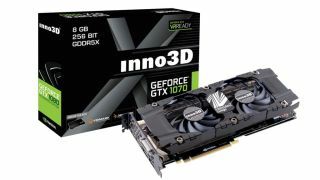 However you do get the Inno3D custom dual fan cooler, and a slightly more fancy design for your graphics card, if you're into that sort of thing. Elsewhere on the Internet, Amazon for instance, you'll find the same card for £454, over a hundred pounds more expensive. You can find them cheaper elsewhere, but usually around £400—so £350 is a great price, and the cheapest you'll find a GTX 1070 right now in the UK. It's not the most powerful GTX 1070 on the market, however it is still a GTX 1070, which just so happens to be top of our current graphics card list. If you want a more detailed rundown of what makes the GTX 1070 so good, you can check out our glowing review.